PaGaian Cosmology brings together a religious practice of seasonal ceremony based in a contemporary scientific sense of the cosmos and female imagery for the Sacred. … The work grew from her sense of alienation from her place, which was personal, cultural and cosmic. This fires a commitment to a cosmology that re-stories Goddess metaphor of Virgin-Mother-Crone as a pattern of Creativity, which unfolds the cosmos, manifests in Earth’s life, and may be known intimately. from THOMAS BERRY, cultural historian, co-author of The Universe Story , and author of The Dream of the Earth and The Great Work . from ELISABET SAHTOURIS Ph.D., evolution biologist, futurist, author of Earthdance , and co-author of Biology Re-visioned and A Walk Through Time . … marvelously impressive … It is a wonderful work you have done for women and the world . This work is a classic firstly because of its rarity as a Southern Hemisphere contribution to the field of women’s spirituality. An awareness of the dual-hemispherical nature of our Mother Earth is often missing in Northern Hemisphere works. A perspective that takes the antipodes into account is decidedly enriching for the field. Secondly, PaGaian Cosmology is perhaps the only work in the field that is informed by the work of Thomas Berry and Brian Swimme, creators of the philosophical groundwork to a range of new disciplines and paradigms, including the increasingly important Rights of Nature movement. Livingstone, in fact, draws out the ramifications of Berry and Swimme’s work by blending their concepts with the Goddess tradition, taking their philosophy to places they, perhaps, did not quite imagine, but which are totally consonant with their premises. The enrichment is two-way: the work also enriches the Goddess and pagan traditions by incorporating the evolutionary cosmology of Berry and Swimme. Thirdly, PaGaian Cosmologyis a classic for the quality of its erudition. This is a serious work of scholarship, extensively and intelligently researched and rigorously documented. Fourthly and finally, this work has been a game-changer for many people in Australia and elsewhere. In this regard, one important characteristic of the work is that it is not just theoretical – it contains scripts for rituals for the eight seasonal moments of the Wheel of the Year. It accordingly invites to a continuing practice of individual, social, ecological, and cosmological transformation and deepening. In PaGaian Cosmology, Glenys Livingstone provides a path using the mythic personification of the Triple Goddess and the Wheel of the Year to celebrate the deep story and sacred nature of the Universe. For me what is so important in the work of Glenys Livingstone is that it is not based on a belief or requirement to believe in the supernatural, but instead is a recognition of the sacredness of the world we see and know, the same world explored and revealed by science. Glenys Livingstone’s work has helped me ground my life within a framework of meaning, which is especially important during life’s difficult moments. For several years, I led Wheel of the Year celebrations in the manner of PaGaian Cosmology. Celebrating the Wheel of the Year in this way with others has been one of the most profound experiences of my life. After years of journeying the Wheel of the Seasons from a mostly-modern Dianic/Wiccan perspective, this book took my understanding to a whole new level. Part spiritual guide, part scientific cosmology manual, part poetry inspiration, and part mythological journey – it had everything that brought me joy in spiritual exploration. Glenys’ work has been deeply inspirational for me in the way I relate to and dance with the seasons ever since. I have been walking with the Goddess for many years. I have a slight interest in very, very progressive Christianity and that is what brought me to the writings of people like Brian Swimme and Thomas Berry about 4 years ago. I have been reading Matthew Fox for over 20 years. But, as the “new Universe Story” was/is being told in Christian circles, I felt like a part of me was dying to find someone who could translate this into a woman and earth centered cosmology/thealogy. You have done it. 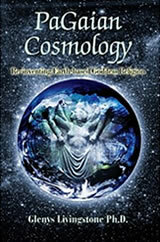 Received Glenys’s book, PaGaian Cosmology and love discovering we speak a common language. Your book is sooooo important, Glenys, … I am truly grateful and thank you for writing it all so beautifully and richly. I feel affirmed and inspired by reading your words. The global quality you share is so deeply important. I don’t want to try and articulate her vision here but it has to do with all of us being Creator, that we are IN earth, and that the feminine metaphor/feminine energy (not in opposition to masculine ) is at the heart of all creation…birthing, the womb, the something from nothing …. And she thinks globally, … northern and southern hemispheres balancing each other and the Wheel of the Year a template for healing/wholing our lives. For those of you who know Brian Swimme’s and Thomas Berry’s work, she relies heavily on them, which I love because those two men have been “speaking” to me for nearly 30 years now. Her book is revelatory for me – affirming what I know but articulating it in new ways. Stunning! There is simply not enough PRAISE for this book! As a spiritual mid-wife, teacher, and ritual facilitator, this is by far, one of the most important books in my collection. My ideas and philosophy on spirituality have been greatly influenced by Glenys’s work. Her book and its teachings have become part of the heart beating at the center of my own spiritual practice. Through her personal “Great Work”, Glenys shares with us a dazzling, powerful and inspiring blend of mythology, art, poetry and ritual that celebrate the turning of the wheel of the year in which she refers to as “Seasonal Moments”. Her profound wisdom and teachings throughout this book are incredibly thought provoking, deep and insightful. This is a book meant to be not only read but lived and its wisdom danced into being. When one puts into practice and lives the teachings presented in this book, they open themselves up to the amazing awareness of the beautiful marriage of the scientific and spiritual that only deepens the connection and understanding of the ever unfolding Sacred. This is a book that even the non-theist or the spiritual atheist can appreciate. Highly recommended. I encountered PaGaian Cosmology just shy of two years ago, during a dreadful bout with anxiety and depression. The timing was perfect. I was questioning everything I believed, spiritually and intellecutally, about the nature and purpose of life. Old systems of belief and action were crumbling, and nothing I found seemed able to replace them. Reading your book was a revelation and a ray of hope. Yes, I cried a lot while I read it, but when I reached the end I realized that they were the necessary, cleansing tears that washed away the old structures that no longer worked for me and made room for a new way to grow. I came through that rough period stronger and surer of myself and my beliefs than at any other point in my life, and PaGaian Cosmology was an essential tool in that growth. On a nuts-and-bolts practice level, the book has heightened my awareness of the intimate link between each Sabbat and the one opposite it on the Wheel of the Year. The balance of the Vernal Equinox is an equilibrium we recapture at the Autumnal. The blossoms that flourish at May Day wouldn’t be possible without the dead matter we committ to the Earth at Samhain. I am trying to be more conscious of looking across the Wheel, of incorporating something into every Sabbat ritual that honors and lays a path for that complementary moment. I don’t always succeed at this, but the attempt has deepened my practice and my sense of the wholeness of the year and the interconnectedness of the systems of life. And so, again, I offer my deepest thanks to you, Glenys, for the amazing book you have birthed into the world. It is truly a gift. I am in an online group and we are doing a book study of PaGaian Cosmology, and I just wanted to let you know it is very slow going because we all love it so much, we are so overwhelmed with beautiful feelings of connection, we need to pause frequently and just absorb it. You are beautiful.